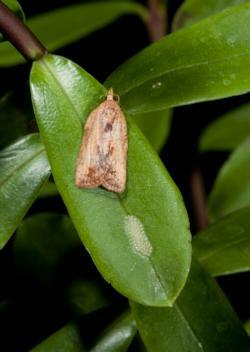 The light brown apple moth (LBAM) (Epiphyus postvittanai), native to Australia, was first detected in the continental United States in Berkeley, California in March 2007. This tortricid leafroller moth (fig. 1) is classified as a high risk pest by regulatory agencies because of its potential to damage a wide range of plant species, its current limited distribution in the world, and its potential to harm agricultural commerce in California and the United States. In general, however, it has not been particularly destructive in areas where it has been found in the landscape or native vegetation in the Monterey Bay Area. There is evidence of a relatively high parasitism rate by native parasitoids, which may be keeping LBAM in check. Losses by the ornamental and berry crops industries are mostly related to the result of regulatory closures and associated losses of perishable berries or nursery stock sales. There have been significant increases in production costs associated with the management of LBAM for affected growers. Insecticide use has greatly increased as growers attempt to eradicate the pest, and more personnel are employed to effectively scout for the pest. We have been conducting research in Santa Cruz and Monterey counties to aid in LBAM detection and management since 2007. Among other research projects, we are evaluating the importance of LBAM in areas around the perimeter of nursery and berry fields because we suspect that LBAM may be migrating from natural vegetation and weeds into these production areas. Scouting methods. Beginning in October 2011, we have monitored the perimeters of eight local nurseries and berry fields in Santa Cruz County and north Monterey counties where LBAM has been previously found. At each scouting location, a pre-defined area is scouted for approximately the same amount of time. 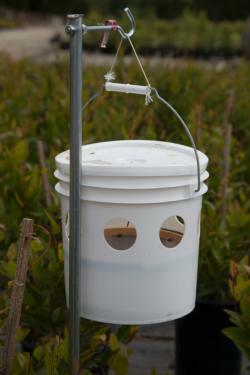 Two types of attractant traps are used to monitor adult (moth) population dynamics: LBAM pheromone-baited Jackson traps that attract and catch male LBAM moths (fig. 2) and bucket traps, baited with a moth attractant (terpinyl acetate and brown sugar solution), that attract and trap both male and female moths (fig. 3). 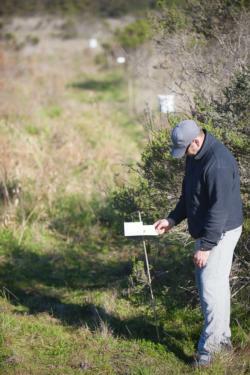 The same numbers of traps are used at each location and trapped LBAM moths are counted. In addition, the perimeter weeds and natural vegetation are identified and are systematically scouted for leaf distortions, folding and other shelters that might be caused by LBAM larvae. If a larva is found in these shelters and has characteristics consistent with LBAM, it is removed along with some of the host vegetation and reared in a laboratory setting until a moth emerges. Specific features found on emerged moths are used to confirm identification of an LBAM larva and its association with a specific host plant. Since the plant host dynamics change through the seasons, the “available hosts” are identified at each location. These would be the host plants that are not only present but also in a growing condition that would be expected to be suitable for colonization by LBAM. For example, winter annuals could be present in the winter through summer period, but would not be considered available when they first emerge in the winter (because they are too small) or later as the summer approaches (when they begin to die). Similarly, perennials such as the native California live oak could always be present in the scouted area, but they are considered available only when they have newly developed foliage that would be suitable for colonization. How the data will be used. The trap data will be used to determine if there are patterns of moth emergence, and when emergence peaks this could identify periods of high risk of moth migration into production fields. With increased migration risk, scouting in the production areas could be intensified to detect young larval stages, which are easier to control with insecticides. Selective and biorational insecticides with Bacillus thuringiensis should only be used to target small larvae, and could be used effectively at this time. Other commonly used insecticides for LBAM, such as spinosad (Conserve) and methoxyfenozide (Intrepid), are also best used when larvae are small. The plant host data will be used to help determine the relative importance of perimeter hosts in supporting LBAM and any particular seasons associated with that risk. With this information, high-risk weed hosts could be targeted for control and scouting in perimeters might be intensified to detect larvae during periods of host availability. Recently we launched a web page that contains the current trap data, updated every two weeks. The eight monitored production sites are grouped into five generalized regions in Santa Cruz County and north Monterey County. For 2011 and 2012, this data shows a relatively synchronized peak moth emergence in early November in all monitored areas. The perimeter host data is not on the web page yet. However, for the 16-month period that data has been collected, the greatest numbers of larvae have been found on Coyote Bush (Baccharis pilularis ), French broom (Genista monspessulana ), Dovefoot geranium (Geranium molle), Buckhorn plantain (Plantago lanceolata) and wild radish (Raphanus raphanistrum). There are 26 different host species that have been identified so far. The website contains information on using the data for forecasting LBAM population development. For example, using a biofix date and degree-day information, growers could reasonably predict the presence of adult emergence, egg laying and subsequent life stages in the field. These terms and explanations are on the web page. Forecasting is still being evaluated for its usefulness.  The website can be accessed through the UC Cooperative Extension Santa Cruz homepage: http://cesantacruz.ucanr.edu/. For questions, please contact me. This research was funded by a Specialty Crop Block Grant (CDFA/USDA).